When you bite into a warm samosa, the first thing you'll notice is its wonderfully tender, thin pastry crust, golden-brown from deep-frying. 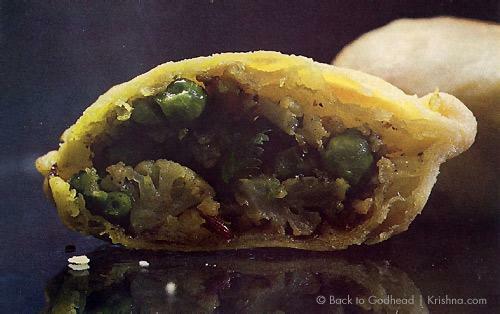 Inside are peas, potatoes, or small chunks of cauliflower, seasoned not too little so that the samosa's bland, and not too much so that it's hot, but just enough to delight the palate. Many flavors harmonize as you taste the crust and filling together, all permeated by the rich, regal flavor of the ghee (clarified butter) that the samosa was cooked in. Even though they taste great, however, there's no point in relishing samosas unless they've been offered to Krishna. That's when they become prasadam. Then when we eat them, besides being delicious, they'll draw our thoughts from matter to spirit—and that will be the perfection of our eating. 1. Mix the flour, salt, and baking powder the mixing bowl. 2. Sprinkle warm ghee over the mixture and rub it between your fingertips until it's thick consistency of dry oatmeal. 3. Make a depression in the center of the mixture, add the yogurt and ¼ cup water, quickly stir, and gather into a ball. 4. Adding ½ teaspoon at a time, sprinkle up to 2 more teaspoons of water to cause the mixture to cohere into a stiff pastry dough. 5. Knead the dough on a smooth surface for 8 to 10 minutes, or until it's uniform and elastic. Then shape the dough into a ball, place it into a bowl, and drape it with a moist towel. Let it sit while you prepare the cauliflower-and-pea stuffing. 1. Steam the peas and cauliflower flowerettes until tender. 2. Over a medium-high flame, heat 2 table-spoons of ghee in a 10- to 12-inch frying pan until a drop of water flicked into the pan sputters instantly. Toss in the minced ginger, chilies, and cumin seeds, and when the seeds begin to darken add the asafetida and white poppy seeds. When the cumin seeds have turned dark brown, stir in the steamed cauliflower and peas. 3. Reduce the flame to low, add all the remaining seasonings, stir, cover, and cook for about 5 minutes. Remove the lid and fry, uncovered, until the vegetable is thoroughly dry. Remove, mash to a coarse consistency, and cool to room temperature. You'll need to mash the filling enough so that the vegetables are no longer so ragged that they can pierce through the thin pastry casings. If you mash the stuffing too much, however, there won't be enough to fill the 20 pastries. After a few practice runs you'll find the texture you like best, and you can adjust the amount of vegetable accordingly. 4. Divide the stuffing into 20 equal portions. 1. Roll the dough into a cylinder 10 inches long, cut the cylinder into 10 equal pieces, and drape a moist cloth over them. 2. Take one piece of dough and make a smooth patty by pressing it under your palm. Dredge the patty with flour once on both sides and, with a rolling pin, flatten it into a thin, round disk 6 ½ inches across. Then cut the disk in half with a sharp paring knife. 3. Dip your finger into a bowl of water and moisten the straight edge of one semicircle. Now shape the semicircle into a cone, gently but firmly pressing the moistened edges together so they'll stay sealed. 4. Carefully place one portion of the vegetable stuffing into the pastry cone. Dip your finger into the howl of water and moisten the inside top edges of the cone. Then firmly press the moistened edges together, thoroughly sealing the stuffing inside the triangular pastry casing. Now place the samosa on the cookie sheet, seam-side down. Finish rolling, stuffing, and shaping the remaining samosas. 5. Over a medium-high flame, heat the ghee or oil in the wok until it's about 365 °F. (You can use a deep-frying thermometer if you have one.) Slip 4 or 5 samosas into the hot ghee or oil and fry for 3 to 6 minutes, or until the crust is crisp and an even golden brown. 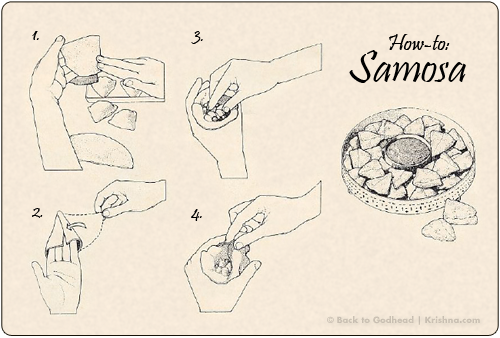 Transfer the samosas to a baking dish lined with a paper towel. Drain and offer to Krishna immediately, or keep warm in an oven preheated to 250° while you're frying the remaining samosas.